This week I listed a 1950s brooch in my Etsy shop. I found this beautiful rhinestone flower years ago, but have held on to it for a while, because honestly, it’s just so special I wasn’t ready to let it go so soon. It deserved a few years of admiring! It’s made by WARNER, which I know because it has a clear stamp mark on the back. I’m so glad when jewelry is stamped. That makes it much easier to learn about it’s origin. There’s not a whole lot of information about WARNER, and the company wasn’t around all that long. The main thing I kept reading over and over was simply that Joseph Warner was the sole proprietor of the company. Ah, the mystique makes it even better for me! Besides scouring the internet about WARNER, I have a handful of books for identifying and learning the history about vintage jewelry that I used for my research. The two that I found most of the information in are Collecting Costume Jewelry 101 by Julia C. Carroll and Costume Jewelry A Practical Handbook and Value Guide by Fred Rezazadeh. My two “go-to” vintage jewelry resource books. Although I couldn’t find my exact brooch, I did find a similar one online. Other than the image, there wasn’t really much information about that specific design, unfortunately. Two similar WARNER flower brooches. The main difference is that mine has larger and more balanced rhinestones than the one I found online. Here’s a basic overview about WARNER. Japanned metal, cat jewelry, insects, florals, dome pins and earrings sets in different color combinations, Christmas tree pins, smaller oval or round pin and earring sets similar to Weiss designs. Japanned metal is a process that makes the metal black, as well as “rust-proof”. So it was an aesthetic and functional design choice. Obviously, not all Warner jewelry is japanned. And since my brooch is not, I’ll include a photo of a set that was referred to as “japanned” in one of my resource books. That’s all there is for today’s lesson about WARNER jewelry. The main thing I know about this particular brooch is IT’S BEAUTIFUL. And although it’s older than me, it sure doesn’t look it. It’s been well cared for and very gently used during it’s 60+ years! 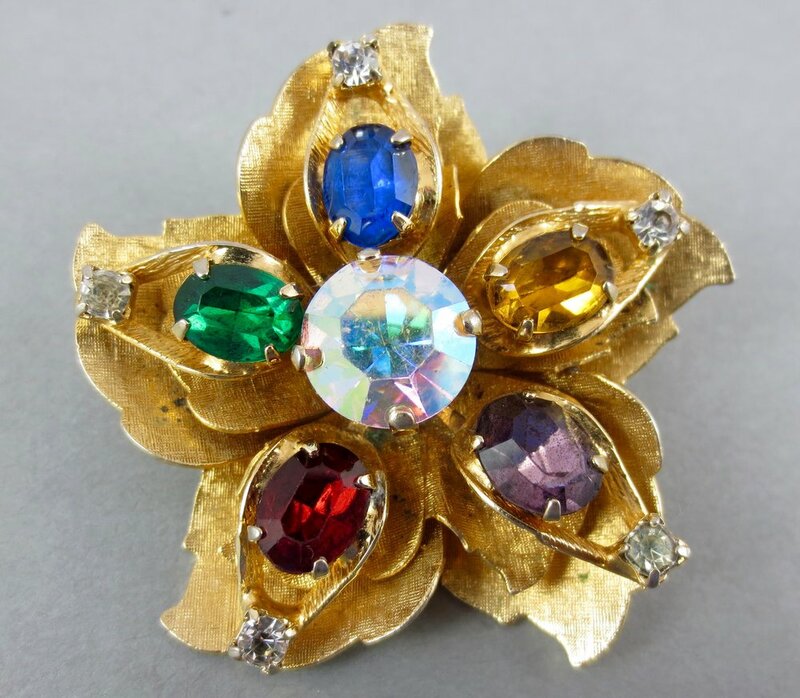 gorgeous vintage WARNER flower brooch. layered gold metal leaves, adorned with multi colored rhinestones. resparkable vintage.